I love the idea of toys and games that promote thinking and logic skills. We have block buddies and love it. However, my budget does not permit me to purchase all of the toys I would like. When I found these craft sticks and cubes at the dollar store, I came up with an easy way to make my own game. Click here to download the cards. There are 16 cards, ranging from simple designs to more complex ones. 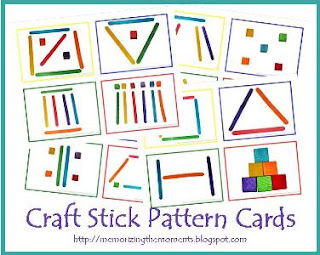 The idea is for him to use the craft sticks and craft cubes to match the design on the card. Super simple and inexpensive!